Part 1 of this FAQ looked at the basics of the standard barcode system and UPC arrangement for retailers. Part 2 looks at the history of the development and successful adoption of the barcode system. Q: What started the barcode development? A: Unlike many innovations, the idea of bar codes was not one where potential users had to be convinced that they needed this better mousetrap (“who would want that, anyway?”) or an idea that needed an evangelist. Instead, the incentive here included formal and informal pleas by supermarket retailers for a better system of inventory control and checkout. Q: When was the first barcode system installed and used? A: The first bar code installation and use in a supermarket is a fully documented event. On June 26, 1974, a package of gum with the Universal Product Code (UPC) was scanned at the checkout of Marsh Supermarket in Troy, Ohio, by one of its managers, using a system provided by nearby National Cash Register (NCR) Corp. (Figure 1). The fully publicized and reported event was not just a public-relations stunt (vaporware); the setting was a real, full-scale setup and installation. Q: Who was the key inventor? A: The bar-code concept was created by Joe Woodland, an inventor and engineering graduate of Drexel Institute of Technology in Philadelphia. He heard about supermarkets’ need for an inventory and checkout solution indirectly, from a local supermarket manager, to a Drexel dean, to graduate student Bernard Silver, and finally to Woodland. He decided to work on the problem and self-funded the effort, cashing in some stock and moving to a small apartment in Miami. Q: What was his approach? A: It was there that he had this insight (as related in his memoir): Instead of using letters or special symbols, he would use an on/off pattern similar to Morse code, but with narrow and wide lines instead of dots and dashes. He also decided that printing them in a circle as a bull’s eye pattern would ease reading them from any angle (Figure 2). He and Silver became partners in the project, and they applied for a patent on the bar code itself and the entire scanning system in 1949; Patent 2,612,994 was granted in 1952 (Figure 3a and 3b). Q: How did the code get scanned in the early designs? Q: But the idea didn’t die? A: Clearly it did not. 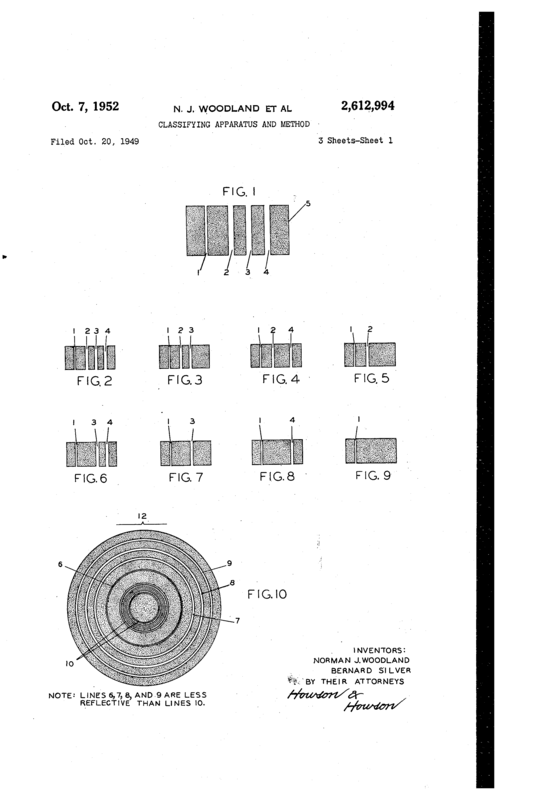 The development of the laser in 1960 (Reference 1), opened a whole new approach to scanning. A large box with laser-based source and scanning-mirror assembly could comprise the front end of a possible system. The first lasers were complicated, costly, glass-enclosed tubes with large power supplies, but could provide a highly focused light source. Since then, of course, laser diodes have become available and they are cheap and easy to drive and use. Q: What about the standard format? A: By the 1960s, many companies were looking to provide a solution to the inventory, checkout, and related supply-chain problems, among them industry giants RCA and IBM. One of the problems was the need for standardization of the barcode design and the data format which the code represented, and how products would be “registered” into the system. Technology vendors, producers of packaged foods, and supermarket chains formed an industry-wide consortium in the late 1960s, informally called the Ad Hoc Committee of the Universal Product Identification Code. Q: The pressure to develop it quickly must have been severe, right? A: Yes, but despite the common goal, it took four years to agree to reach a final agreement, for the usual reasons: Individual participants had their own priorities and concerns, and there were also some “NIH” (not invented here) issues as well. There were also concerns about finding label space for the barcode block, as some vendors did not want to give up precious package-label “real estate” needed for the printed code or disliked the visual aesthetics. Q: Were there issues with the printing, as well? A: Somewhat surprisingly, there were even problems with the mature technology of printing. It was difficult to achieve consistent quality when printing the small bulls-eye code (about 1½ inches wide) on the many types of package labels, as it required maintaining line width and minimizing bleeding to avoid scan-read errors. Further, committee members were also concerned about the real-world post-printing effect of dirt, finger smudges, and creases in the labels on cans. Q: How was this overcome? A: It’s a “come from behind” story: the committee’s final set of requirements was that the code could occupy only 1.5 square inches, needed to encode only ten digits (this has since been expanded to 12 digits), be readable at high speed in any direction, and have only one undetected error in 20,000 readings. Industry-leader RCA demonstrated a working system using bulls-eye codes and appeared to be the leading contender for setting the code standard and defining the overall system. Q: But that’s not what we have — what happened? A: Come-from-behind contender IBM won the final design, with their proposal of straight bars rather than the bull’s eye pattern and using a line-position coding scheme (Reference 3). This was due to efforts of engineer George Laurer, who knew that circles easily smeared in many high-speed presses (Reference 4). IBM was able to demonstrate a system which read packages without error even when they were “thrown” across the laser-based scanning system at high speed at random orientations. In 1973, the committee formally approved the first bar code format. Since then, many other standard formats have been adopted, with different aspect ratios, number of digits, code sets, and shapes. [Note that there is some irony in the RCA loss. When color TV was first developed, the leading approach was developed by CBS. It used a mechanical spinning color-filter wheel and it was even approved by the FCC to be the nationwide standard. But RCA and its strong-willed and determined leader, David Sarnoff, thought a mechanical system was not suitable for mass use and had inadequate color quality. He and RCA spent the present-day equivalent of billions of dollars (all from their own funds!) to instead develop the color system that was ultimately adopted and prospered for over 50 years until our present-day digital TV standard was developed, and certified (Reference 2). Q: Where was the barcode system put into widespread use? A: K Mart was the first major retailer to install a system and Wal-Mart and others soon followed. Now, it’s almost impossible to find any retail outlet without one; even the tiniest stores have it. Countless non-retail applications, such as warehouses, repair tracking, and many more also used barcoding. The codes can also be printed on demand and attached to things like blood vials as the test sample is being drawn. Q: Did the person behind barcodes get recognition? A: Yes, Despite the long and largely unproductive period between prototype and adoption, Woodland lived to see his idea become an unimaginably ubiquitous success that transformed the entire worldwide supply chain (partner Silver passed away in 1963 at age 38). Shortly before he died in 2012 at 91 years, Woodland was awarded the National Medal of Technology by President George H. W. Bush for the invention of bar codes. Q: Are there non-printed alternatives to barcodes? A: Yes. Radio-frequency ID tags (RFID), both active (powered) and passive (stimulated power) are also widely used, but no other technology has the reach, low cost, and ease of implementation of barcodes. Of course, RFID tags have their virtues; among them, RFID can also be read at a distance; in some cases, this can be several feet of range. Barcodes can have attributes with virtues or limitations. They cannot be written to, unlike some RFID tags with internal memory which can be written to store new information and updates. Still, the fact that the bar code can’t be hacked remotely (unless you place a fake label over it or change the database) is a virtue. The zero or near-zero cost of adding a barcode to a product is important as well, even if the RFID tag only costs a few cents. A barcode can be pre-printed or created on-the-spot, can be checked visually, and is simple to work with. Q: Is there a case where RFID supplanted a barcode system?? A: Yes. An RFID system replaced the larger-format barcode system which railroads used for a few years in the 1980s to track every freight car on the move. Despite many efforts, the realities of the unavoidable dirt, rust stains, graffiti, and weather conditions made the optical barcode system unreliable and was replaced by an RF tag. Q: How are barcodes being extended? A: We now have numerous standard and proprietary 2D barcodes and QR codes which can pack much more information into the printed zone and can be easily read and decoded with special scanners or smartphones. Like so many other developments, barcodes are the result of hard work, insight, determination. Despite the presumed simplicity: “it’s just a bunch of printed lines, so what’s the big deal?”). But a successful and practical complete system also required developments in the optical and scanning areas, as well as computers for managing the associated database. Due to the widespread use and importance of barcodes, and their well-documented history, there are many available technical and context references; some of these are listed below.